When NCR discontinued the PC4 they released the PC6. This was a true IBM PC/XT clone. It had a discrete CPU unit and monitor. It also had a "turbo" button to change the clock on the 8088 CPU from 4.77 to 8 MHz, processing information nearly twice as fast as the PC XT. It was available with either monochrome or CGA graphics. 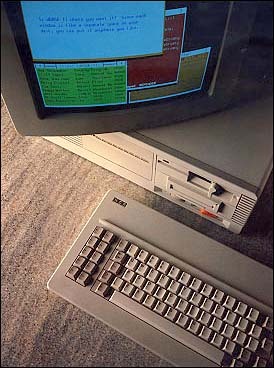 It was bundled with NCR-DOS, GW-BASIC, Getting Started booklet, NCR User Interface, NCR PAL, NCR TUTOR, On-line NCR HELP, and User Diagnostics. Pictures and info needed ! KEYBOARD Enhanced full-stroke keyboard. Seperate command and cursor keys. RAM Memory expandable to 640KB on the main processor board. TEXT MODES 80 x 25? I/O PORTS RS232, Centronics / Parallel, 8 x PC-XT compatible expansion slots. see more NCR PC6 Ebay auctions !